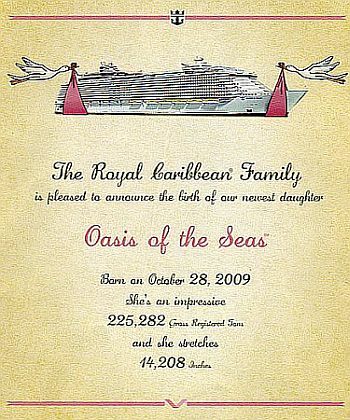 I’ll be spending two nights on Royal Caribbean’s new Oasis of the Seas over Thanksgiving weekend. The purpose of the trip is to experience and learn all I can about this fantastic ship. The challenge is to do it in only 42 hour!. I will be particularly interested in the ship’s accessibility for guests who have disabilities and also how this ship can best suit groups. Oasis of the Seas is opening her doors to thousands of travel agents and news media over a two week period. If you watch television, it would be hard to not have heard about “the world’s largest cruise ship.” Heck, this thing is sailing with a blimp, carousel, multiple “neighborhood” areas, a zip-line and other unique features as well as RCCL’s standard feature, a rock-climbing wall, and a FlowRider which has been popular on all of Royal Caribbean’s larger ships. Most agents will be checking cabin categories, public areas, trying the food and seeing what the shows and entertainment are like so they can best guide their clients to the kind of vacation that many people dream about. But an “access travel specialist” has extra duties. We’re recording access (or lack thereof) details. We are measuring lengths, heights and widths, and taking photos of things that make some people scratch their heads. “Regular” agents aren’t typically taking photos of toilets, lips in doorways and unisex bathroom signs. They also don’t lay on the floor to take a photo of a glass of water on a ramp to show the angle of the ramp in a cabin. Then again, typical travel agents don’t get as excited as our Access Travel Team specialists when we see a door handle instead of a doorknob on a public room door! Yep, we are a bit of an anomaly in the travel industry world. My tape measure, camera, new Flip Video, battery charger and detailed deck plan are all ready to be packed. My list of questions and specifics to check on is growing. As well as the questions and details from our office, some clients have asked that I check specific items and members of Cruise Critic responded to my offer by listing some of their questions and concerns which have been added to my list. Do you have an access detail you’d like for me to check on? No promises that I’ll get to it, but I’ll certainly try. Just respond back as a “comment” to this blog with your question before Thanksgiving and I’ll add it to my list. I have some things I would love for you to find out for me! I have a 6'1" brother who is minimally conscious. We would love to know about accessibility for him: what are the sizes of wheelchair accommodations? His chair is bigger than many, due to his large size. What accommodations are there for a hoyer lift? Do they lend electric chairs? Are there air beds or any special bed accommodations for someone like him? I just got back from 3 nites/days on Oasis.... I would love to chat with you about my experience. My husband uses an electric w/c and we have worked with your great agency in the past. I was traveling without my husband on this trip and am thankful that he was home. Lots of concerns about oasis. The size of the cabins depends upon the category, but generally speaking they are 50% largerto accommodate turn-around space as well as space to roll down next to the bed. Beds are open frame so they can accommodate the base of a Hoyer. If you don't have a travel Hoyer to bring, one can be rented from a travel rental equipment company and delivered to the cabin. The cruise lines do not offer additional mattess types. Hospital beds (standard mattress) can be rented. We would be happy to work with your family to attend the details needed for your brother. Also received your phone message & left a voice mail. Congrats on being part of the GMA group! Please do call me at 610-532-0989 or 888-532-0989. Looking forward to chatting with you & hearing your feedback. Did the Oasis have a ramp into any of their 10 swimming pools? 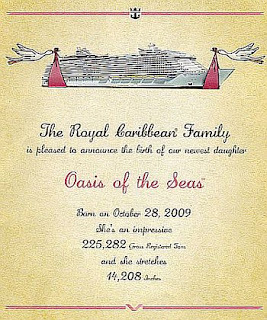 I am excited about my April Oasis cruise. My son does not care about port stops as the cruiseship offers so much. Will the flow rider, zip line be available when docked? There are 4 pools, 10 hot tubs, 2 FlowRiders and the H2O Zone/aqua park. Unfortunately none of the pools are ramped. One was erroneously being referred to as a "zero entry pool", but it's NOT ramped. The main pool has a lift and a lift is going to be added to one of the hot tubs. It's possible that the FlowRider and zipline could be open during port days, but I was advised that the schedule will need to be checked on board to know the answer. This ship is very exciting with lots to do. I think your family will be wowed by what all is on this ship. 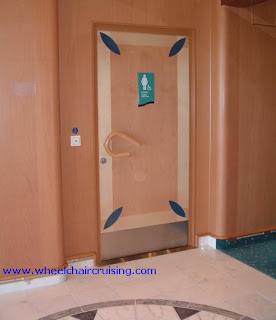 We have more access Q&As at http://www.wheelchaircruising.com/CruiseCritic.html and we've got our Oasis photo gallery at http://www.wheelchaircruising.com/Oasis_of_the_Seas.php . Thanks for your quick reply. (After cruising with arrangements made by your agency, Vicki in particular, I am not surprised.) I am going to check out your other 2 sites. Your sites, http://www.wheelchaircruising.com/CruiseCritic.html and http://www.wheelchaircruising.com/Oasis_of_the_Seas.php are excellent and created so soon after your trip, too. I think I'll go prepared to use the pool lift. Twenty new photos of cabin 9162 (accesible balcony) were loaded onto the photo gallery tonight. We are not making public much in the way of measurements, some things to watch for and accessible route information as we are reserving this for our clients. Vicki or I can discuss these types of things with you.